There is a growing interest in Chiropractic care for kids. We often see that when people experience how Chiropractic can help, they naturally ask if their kids would experience the same positive effect from our care. The answer is yes! Kids need Chiropractic too! Amazingly, children regularly experience an even quicker response to Chiropractic care than adults. This can be due to adults having poor habits ingrained into their lives and spines and children having such a high vitality. Why do children get checked by a Chiropractor? Children should be checked by a Chiropractor because of the importance of a child’s spine and nervous system. A properly functioning spine and nervous system is essential to good health. A Chiropractor can support the proper functioning of a child’s spine throughout their development naturally. This can greatly impact how a child grows and experiences life. Children also should be checked often due to the incredible amount of physical, chemical, and emotional stresses that they have to adapt to while they are growing and learning their new world. Read below for some milestones that are important to get a chiropractic check up for your baby. Insure the health of the next generation with regular family chiropractic care. 1. After the birth process. 2. When the baby starts to hold his/her head up. 3. When the baby sits up. 4. When the baby starts to crawl. 5. When the baby starts to stand. 6. When the baby starts to walk. Learning to walk can certainly create some spinal stress on our little ones! Here is a video of Dr. Callum Peever’s little girl learning how to walk at 1 year old. All the little stumbles certainly add up! This little girl is fortunate that her father is a Chiropractor and can help ensure that her spine and pelvis stays subluxation free! With all you do for your newborn child, please ensure his or her spinal health with a chiropractic spinal checkup. We can help in Mississauga at Erin Mills Optimum Health. We look forward to meeting your little one! – Contact Us. For information on chiropractic and healthy birth visit the International Chiropractic Pediatric Association at http://www.icpa4kids.org. – Dr. Callum Peever has attended some ICPA events and commented on them here. Curious about Chiropractic care for children? In this blog we discuss and link to common myths associated with Chiropractic care and children. I had the opportunity to attend an ICPA conference in Toronto for adjusting infants, toddlers, kids, and children. It was great to learn more ways to analyze an infant and toddler’s spine for subluxation. It always amazes me how incredible the human body is when you can input such a gentle touch and have such an incredible reaction to a child’s body functioning. The majority of the testing was comparing muscle tone of identical muscles from left to right to determine what the body was attempting to do. If the body was attempting to move an Atlas (the first vertebrae in the neck) from right to left but was unable to accomplish this because the joint was resisting the movement then this is identifiable through gentle touch by a trained Chiropractor. The specific and corrective adjustment supports the body in its attempt to align the spine. As the tree is bent so grows the tree. The importance of having a child’s spine checked for subluxations regularly was also highlighted during the course. Not only is the birth process challenging for a mother but for a baby too. The earlier the spine can be checked for any subluxations the less time the body has to function in a poor position. Also, the rate at which kids grow is astounding. My daughter is almost 6 weeks old as I write this and I am trying to slow time down as I watch her change, grow, and learn. As she starts to experience life and learn new things her body and spine will be put under new strains and she will experience more falls, slips, and twists. By checking her regularly for subluxations in her spine I plan on making life as enjoyable and positive for her. Also, these small mechanical and neurological skills she is learning so quickly are being ingrained into her nervous system everyday and at every moment. If she is in a poor position or is subluxated in her neck or pelvis these movements will develop imperfectly over time. The longer these imperfect behaviors are left to time the more improper the behaviour will be as an adult. That’s why as a Chiropractor I am curious about an adults childhood history, as bad and good body habits in the past are one reason why you are who you are now. 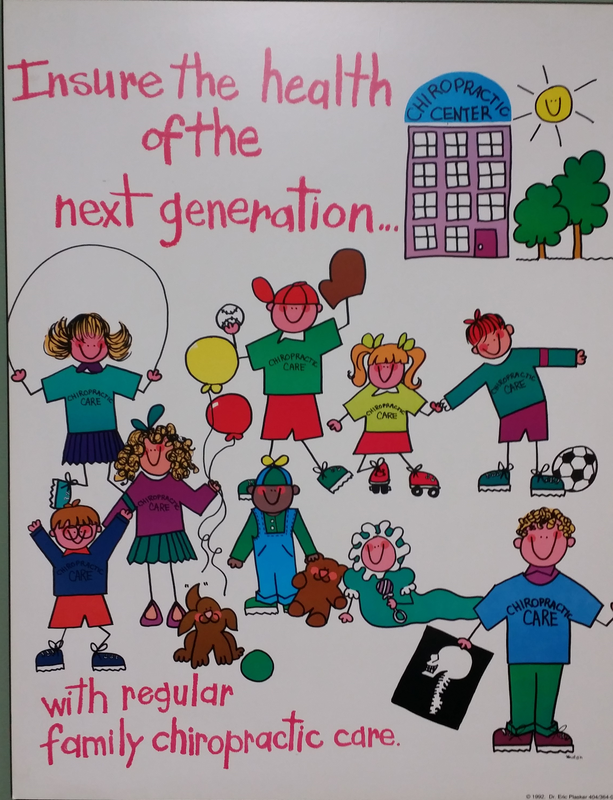 Insure the Health of the next generation with regular Chiropractic care! The following is an abstract from a retrospective analysis of children undergoing Chiropractic care published in 2018. The link to the article is directly above. series is to report on the benefits of wellness based chiropractic care for pediatric patients. than other children of the same age. The article discusses Complementary and Alternative Medicine, Chiropractic Care, Wellness Care, and Maintenance Care as it pertains to children. The Chiropractic technique used with these patients was a hands on, full spine diversified technique with modifications for age. Testing also included spinal thermography and surface electromyography analysis. Be curious, ask questions, and apply what you learn.